In a video posted to social media, a white school police officer is seen punching and pulling the hair of a 15-year-old black female student who was allegedly involved in a fight at Hazleton Area High School. In a viral video posted to social media, a school police officer is seen punching a black female student in the leg and pulling her hair while attempting to subdue her during a fight at a Pennsylvania high school. The video uploaded to Facebook on Monday shows two female students being held down by officers following an altercation in the cafeteria at Hazleton Area High School in Luzerne County. One student gets led away by two officers as she screams "let me go." The other student is repeatedly punched in the leg by a white officer, pushed onto the cafeteria table and pulled by her hair. According to Buzzfeed News, Hazleton employs both security guards and school police officers. 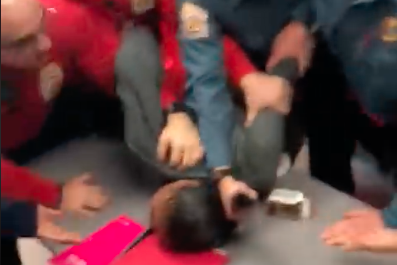 It's unclear at this time whether the officer in the video punching and pulling the student's hair is a police officer or school security guard. WBRE reported both students, age 15, were allegedly in a fight when the violence escalated and officers intervened. School District Police Chief Ed Harry said the "officer had to get that under control immediately." Superintendent Brian Uplinger told WBRE "there are always two sides to every story, and it's really important for parents and students and community members to get both sides of those stories before going to social media." At least four students were expelled because of the incident, according to WBRE.